Our courses have been designed and developed to be modular with a flexible approach for busy, working professionals. Our audio visual e-learning programmes ensure that you can tailor your studies around your work, family and social commitments whilst still enjoying tutor support and individual practical training. You can also build your qualifications in line with your needs and budget. RPL is a process that allows learners with work experience and/or other related learning to proceed directly to assessment without having to complete the full course of learning. A learner may wish to gain a unit or qualification but already possess some subject related skills, knowledge, experience and understanding. ​The RPL method of assessment considers whether a learner can demonstrate that they meet the assessment requirements for a unit through knowledge, understanding or skills they already possess. 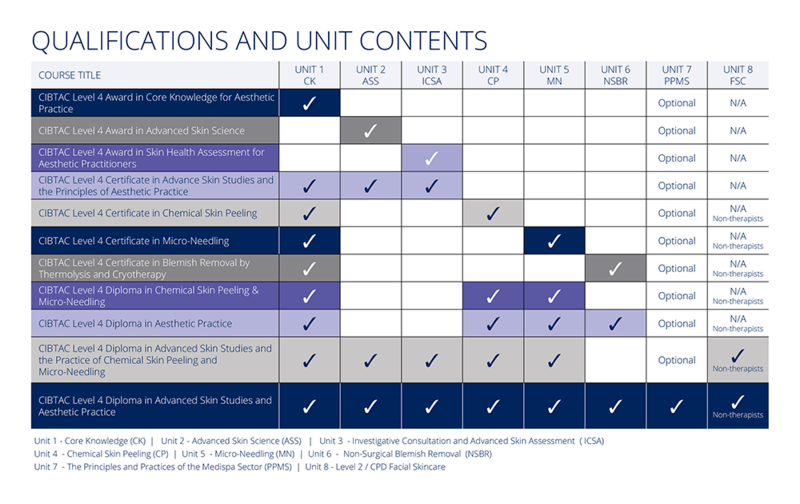 ​Our access courses comprise a series of qualifications which provide a solid basis on which a career as a specialist in skin health management can be based. Whether you are a qualified beauty therapist or medical aesthetic practitioner, or indeed from a non-therapy background, these courses provide essential knowledge and understanding on which you can build an advanced level of understanding and skill in order to progress within the aesthetics sector .